The more I look at these pictures, the more I think the reverse – placing British people cycling in a Dutch context – would have an equally alienating effect. People respond to their enivironment with the appropriate behaviour. Placing them in the alternate reality makes the differences painfully clear. I think the point of the article isn’t about people that already cycle. It’s highlighting that mass cycling (including elderly and children) is never going to happen in a million years in the UK when we have very little alternative but to mix with heavy volumes of traffic and fast speeds. Of course transplanting our cyclists into another context would be equally alien. That isn’t what the message is. Your point reminds me of the passage in Pete Jordan’s book ,In the City of Bikes’, where he, a life-long American ‘Vehicular Cyclist’ has just moved to Amsterdam and bought a bike. Outside the bike shop he mouts his bike – and daren’t ride off. The environment is just too aliean he doesn’t know how to cope! mreover he is intimidated by the confidence and competence of the Dutch riders. I imagine these scenes reversed, and how odd the helmet & dayglo brigade would look on a Dutch cycle path. Excellent. I almost feel it would be nice to have the (Dutch) originals alongside in case people don’t click through. It really highlights what cycling could be like (and is like not so far away). I still feel like a lot of people in the UK can’t even imagine subjectively safe pleasant cycling, they’re so used to seeing cyclists dressed like urban soldiers dodging through busy motorised traffic. And why Sustrans are ultimately a total failure and becoming more of a joke to those in the know. ‘National Cycle Network’ my arse! DOnt get me wrong, some bits are brilliant, but try to use the NCN to commute on and well, you wonder what the point is. I use parts daily, some bits I love, some bits would require miles of detours, some bits are still on painfully scary roads. I guess once my imminent arrival is here & I’m usign the cargo bike with him on the back, that will test my mettle as to my attitude towards cycling. Right now I’m so beligerant that two office moves mean I wont give in & have a 30 mile daily triip & I hope to prove to the world that family cycling in post-industrial Pennine Lancashire can be a reality, but I’m not confident and if I become defeated, there’s absolutely no way other families would contemplate it (I am that stubborn). 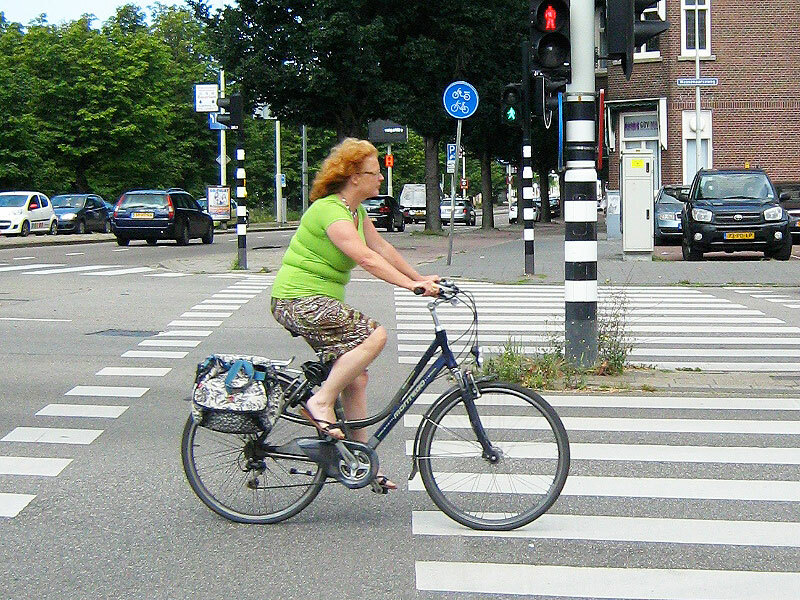 You failed to include the less visible aspects of the Dutch cycling culture. The Dutch bicycling education program which is part of the educational cirrocumuli, the training parks and testing / demonstration before the constabulary and sign off is required before students may ride their bicycles to school in urban centers. The motorist training and laws which place assume liability / responsibility on the motorist in the case of a motorist / bike crash. Bicycle driver education should not be confused or compared with advocacy for increased mode share. Bicycling education is about providing the knowledge of rights and regulations, basic and advanced bicycle handling skills, and the best bicycle driver practices which enable the safe integration into the transportation system, in an orderly and predictable way. Readers should follow your link for the child bicycle riders in your first photo and take note of the environment from which you transplanted them. You do a disservice to bicyclists everywhere by advocating for increased mode share of bicyclists by marginalizing the efforts of those who are interested in promoting cycling rights and best practices. It’s not education that holding cycling back in the UK. People are terrified of being crushed to death. Even experienced, trained, safe riders get crushed to death. One should note that the Dutch school traffic exam by bicycle isn’t finished before the kids are about 11 years old, and not started before they’re about 9 or 10. So the smallest of kids in the pictures never had this school bicycle training. He’s right, you can educate all you want, but that won’t make more than a marginal difference in mode share. Just make it safe, and do so everywhere, and you’ll see that the modal share for cycling will grow very fast. tphilpin: you are unfortunately absolutely wrong, while Koen is absolutely right. Dutch children have in some cases cycled to school for five years *before* they take any kind of test. We moved here in time for my youngest daughter to go through the last year of primary education. Within a week of starting at the school she went on a school trip to the city centre. Months later they took part in the cycle training examination. All the local schools do it at the same time because the organisation involved is quite extensive. The examination requires that each child cycles about the same distance again around the city. Each child wears a tabard with a number on it so that volunteers on street corners can mark whether the children were riding appropriately and made no errors. But note: To get *to* the examination the children all have to ride about 5 km through the city. And whether or not they passed, they all then have to ride back home again. No-one stops children from cycling based on the result. This video was shot on a day when the school tests were taking place. These children (two different groups) are cycling either to or from the test. It’s a nice day out for the kids, and by the age at which they make these trips it’s far from the first time that they have done this sort of thing. David, So why did the group of children wait before crossing the intersection … intuition? Some genetic predisposition? Education perhaps? Can you ignore the fact that generations rode bikes to school and to work before owning a car? Why do kids wait before crossing the road on foot? Of course children should be trained in basic road safety, but we don’t forbid them from walking if they don’t. We also have pavements/sidewalks, and light-controlled crossings, and pedestrianized streets, and routes through parks. We don’t depend on training to keep pedestrians safe: we separate them from traffic. 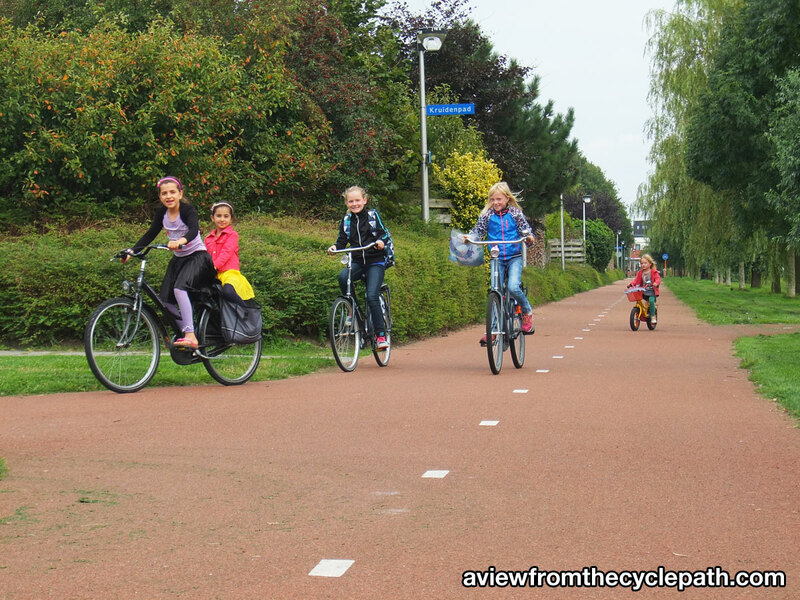 Anyway, one of the things that the Fietsersbond and similar Dutch organizations recommend is for parents to help teach their kids to cycle by taking them on the routes they will use the most, such as the school run, until they have shown that they are competent to do that on their own. It is easy to find this being done on YouTube videos from the Netherlands. As Koen and David Hembrow say, that’s before they have completed their training. Indeed, a few hours training is additional to hours and hours of cycling experience before and after. Currently, how many UK parents have the incentive to accumulate the hours of riding experience of say, an average 10 year old Dutch child, let alone their kids? 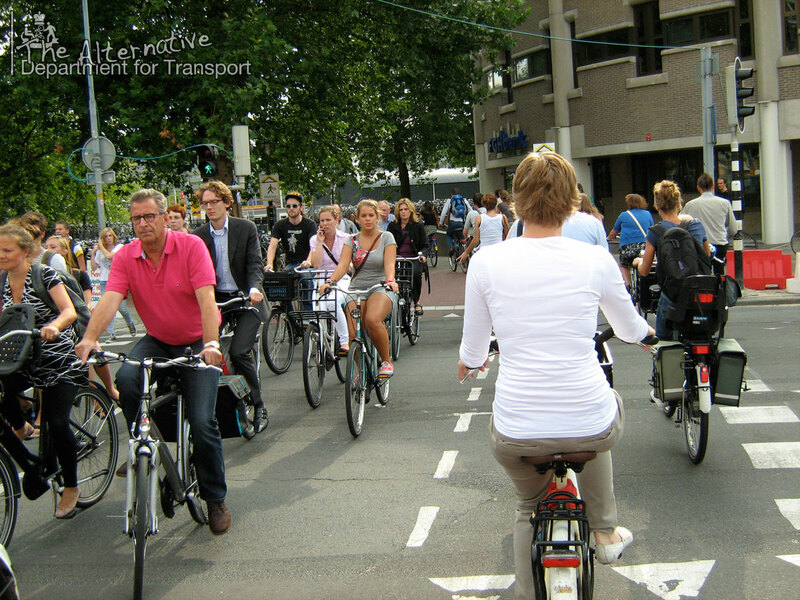 The whole blog post – in fact, almost my entire blog – is dedicated to showing how the way to make cycling safer and more popular is to create the right conditions for it, so people don’t have to “integrate into traffic”, because the vast majority of people simply don’t want to ride a bike amongst motor traffic, and never will. Tell John Forester I said hi. Nonsense. It is in no sense ‘marginalizing’ the efforts of cycle trainers to point out that there’s no reason to think they have the power of bringing about mass cycling. Please reread the ‘epilogue’ to the OP. You’re misunderstanding everything here. First of all, this is about increasing mode share, not educating people. Nevertheless, the rules of the road really are not stupendously hard to understand. As it is, many American children and adults can and do [illegally] drive cars without having ever taken a test. Yet somehow, they learned or figured out the rules because the vast majority of them manage to do so just as bad as the licensed drivers. Probably because they’ve seen it done by other people, even if they weren’t being formally trained. By the same token, Dutch children learn the “rules of the road for drivers of vehicles” before they can even spell their own name, much less read a pamphlet on them. Biking is a normal part of daily life for them, they get to be “educated” every time they want to go somewhere. You’re also completely off base on strict liability. It’s not a blanket indictment any time a motorist hits a bicyclist. It applies only in a limited set of circumstances and is strictly financial in nature. The Dutch are fond of their cars as well, but we still do have the cycle-infrastructure most countries lack, that may be a reason not to give up hope.